Stepping out of my black and neutrals comfort zone, I’ve been opening up to the world of color that fashion is currently offering, and I must say, I’m into it. This digital-print top is another piece from the Prabal Gurung for Target collection; the vibrant lime, ice blue and bursts of berry hues mix perfectly together. I love Prabal for grounding it with black trim and mesh panels so it doesn’t feel too sweet (as prints often can). To top off the brights, I chose my new flash-mirrored aviators in orange. You might recognize them from my Spring Wants & Needs post. I couldn’t resist. They just feel so fresh for spring/summer and I can’t wait for beach days when they’ll really make a statement. Have you been flashing your brights lately? Send me your looks on Twitter and Instagram, @herwritemind. Top: Prabal Gurung for Target. Pants: rag & bone jean. Sunglasses: Ray Ban. Shoes: Vince Camuto. Seen on just about every other runway for Spring 2013, bold black and white is currently reigning as a major trending topic. Of course, the classic couple never exactly went OUT of style (and never will), but at the moment, designer-sunglassed eyes everywhere are focused on the sharp contrast cultivated by this iconic match-up. As someone whose closet consists of roughly 75% black and white, I’m all in with this trend and ready to make a graphic impact. For this look, I opted for a fluid sheer white button-down with black trim and my new rag & bone tailored black shorts with leather detailing. Leather cuff sandals punctuate the ensemble with a structured edge, while bright coral lips add a vibrant shot of color. I even took a risk and (eeeek!) went sans eye makeup to give the lips a more dramatic effect. After all, fashion is nothing without a little risk. What do you guys think? Let me know in the comments and tweet me your black and white looks! Top: GUESS. Shorts: rag & bone. Bag: Alexander Wang. Shoes: Alexander Wang. It’s finally starting to feel like fall in LA, and I couldn’t be happier. I tend to get much more creative with my looks when the temps drop a little since i can add more and more layers into the mix. Scarf and sweater weather is my happy place. Today I debuted a few pieces that have been patiently waiting in my closet for a few weeks — a black and navy cardigan from Kirna Zabête for Target and black plush leggings from rag & bone jean. I’m already obsessed with both and I know they’ll be staples in the upcoming months. The cardi is finished with leather buttons (probably faux since it was rather budget friendly) and a sheer woven panel down the spine to give it that extra detail that really makes it stand out. The leggings are extremely soft and super comfortable. 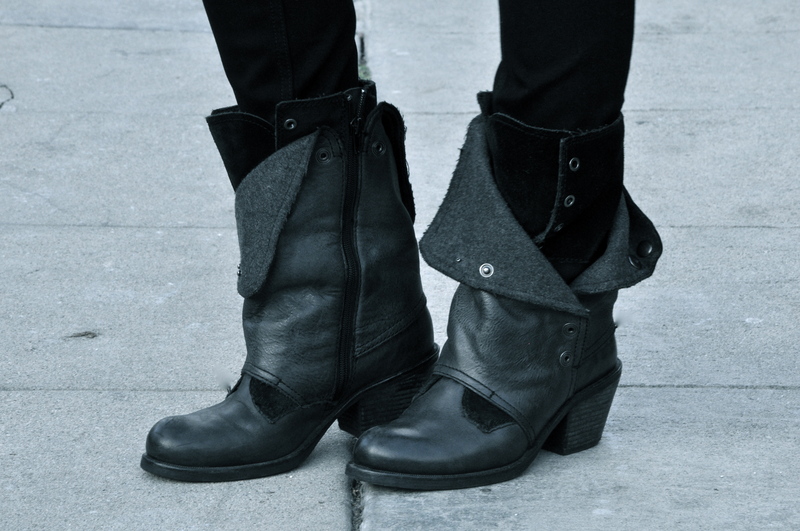 They’re skinny enough to tuck into even my short fold-down boots which is a huge plus. 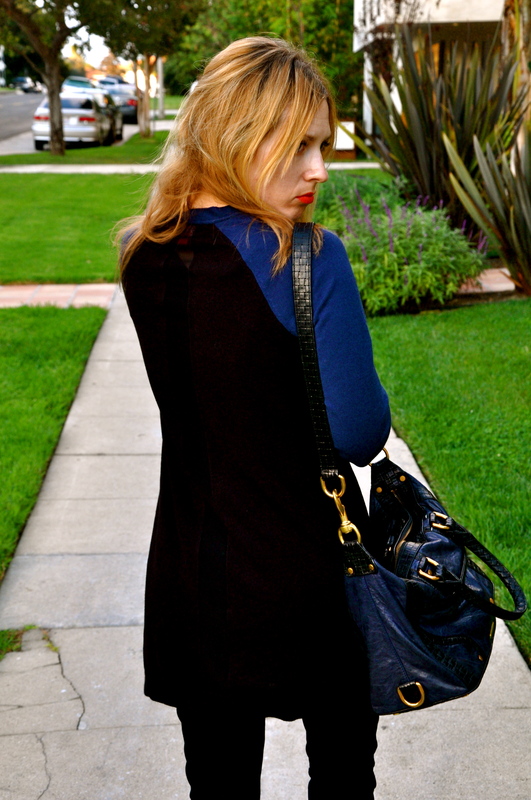 By keeping the rest of my look all black, the navy contrast really pops which is what I love most about this look. Sweater: Kirna Zabête for Target. Pants: rag & bone / jean. Bag: Rebecca Minkoff. Boots: Luxury Rebel.